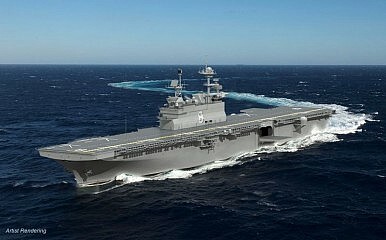 Last month, the US Navy awarded a contract for the construction of a third large-deck amphibious assault warship. In June, Huntington Ingalls Industries, the United States’ largest military shipbuilder, has been awarded a $273 million contract to build the U.S. Navy’s newest amphibious assault warship, according to a company press release. The total contract value for the construction of the third America-class amphibious assault ship is estimated at over $3 billion. The June 2016 contract between the U.S. Navy and Huntington Ingalls shipbuilding company includes “planning, advanced engineering and procurement of long-lead material,” for the new vessel. One America-class ship takes approximately five years to build. The LHA 8 [LHA stands for amphibious assault ship, general purpose], will be constructed at the Huntington Ingalls shipyards in Pascagoula, Mississippi, where LHA 7, the USS Tripoli, is currently being assembled. The USS Tripoli is expected to be launched in the summer of 2017 and commissioned into the U.S. Navy in 2018. As I reported previously (See: “US Navy Build Largest-Ever Amphibious Assault Ship for F-35 Fighters”), the ship is specifically designed to accommodate Marine Corps F-35B Joint Strike Fighters, along a host of other aircraft such as MV-22 Osprey tiltrotor aircraft, CH-53 Super Stallions, and UH-1Y Huey helicopters.America-class amphibious assault ships are 844 feet (257 meters) long with a 106-foot (32 meters) beam and weigh approximately 44,000 tons. “America (LHA 6)[the lead ship of the class] is nearly three football fields in length and is 20 stories high from its keel to the top of its deckhouse. It has 2 acres of flight deck,” according to an Ingalls Huntington press release. An America-class amphibious assault ship is equipped with up to nine F-35B Joint Strike Fighters, four AH-1Z Viper attack helicopters, four CH-53E Super Stallion helicopters, 12 MV-22 Osprey, two MH-60S Search and Rescue helicopters and 12 so-called defensive weapons systems including two rolling aircraft missile RIM-116 Mk 49 l launchers; two Raytheon 20mm Phalanx CIWS mounts; and seven twin .50 cal. machine guns. The press release does not specify whether there will be design changes in comparison to other ships of the class. LHA 7 saw some changes and improvements over the lead ship of the class, as I noted elsewhere. In particular, the flight deck structure had to be modified on both the LHA 6 and LHA 7 in order to accommodate the F-35B aircraft. The ship will have a crew of 1,204 and can transport up to 1,800 troops and their equipment. It will be capable of transporting and land “elements of the Marine Expeditionary Unit (MEU) or Marine Expeditionary Brigade (MEB) with a combination of aircraft and landing craft,” according to the U.S. Navy’s website. Overall, the U.S. Navy intends to commission 11 America-class amphibious assault ships over the next decades.